As you know, our Investment Committee diversifies your portfolio into three broad categories – fixed income (mostly bonds), stocks (large, medium, and small domestic and foreign companies), and multi asset strategies. Many of you have asked, “Tell me more about those multi asset strategies”. The goal of this category is a low correlation to the performance of the bond and stock markets. The purpose of that low correlation is to smooth out performance results (e.g., not moving in lock step with the stock market). It is achieved by utilizing a variety of the following strategies. A global macro strategy is a hedge fund-like strategy that takes long and short positions in various equity, fixed income, currency, and futures markets based on economic and political views of various countries (i.e., macroeconomic principles). Tactical strategies seek to provide capital appreciation and/or income by actively shifting allocations between asset classes. Material shifts are made across equity regions and bond sectors on a frequent basis. These funds typically have a flexible “go anywhere” approach in a balanced portfolio that seeks attractive asset prices. A market neutral strategy seeks to profit from both increasing and decreasing prices in one or many markets. Simply put, managers buy securities that they think will go up and they short (i.e., bet against) securities they think will go down. Market neutral strategists may also use other tools such as merger arbitrage, shorting sectors, etc. REITs own diversified real estate properties such as apartments, office buildings, shopping malls, storage facilities, etc. They provide access to ownership of real estate throughout the country as well as globally. The graph above illustrates the benefits of multi asset strategies in a portfolio. 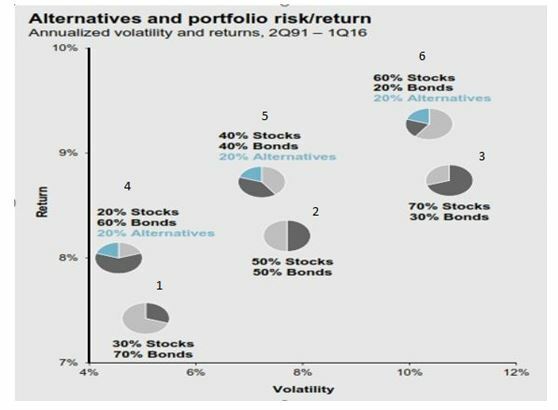 The returns and volatility of traditional stock and bond blends are indicated for portfolios 1, 2, and 3. The inclusion of multi asset strategies in portfolios 4, 5, and 6 increased returns and reduced volatility over the period of 1991 (2nd Quarter) to 2016 (1st Quarter). Compare portfolios 1&4; 2&5; 3&6.